Picture-perfect and full of old-world charm, Eze is a characteristic Provençal village-perché (perched village). It stands high above the surrounding countryside and was originally encircled with impenetrable walls to protect against invasions. 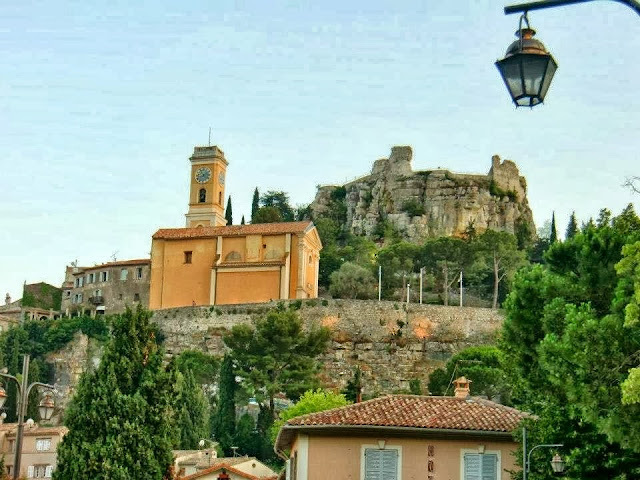 What's so special about Eze is that the village is on the French Riviera overlooking the Mediterranean Sea. In spring or summer, the cerulean seas create a dreamy backdrop. Lush gardens cover the hillsides, providing heavenly aromas of jasmine, lavender and roses. Two renowned perfumeries, Fragonard and Galimard, use local blossoms to create delightful perfumes. To discover the village's culinary treasures, enter the town's gate and follow the narrow cobblestone street until you reach the luxurious La Chèvre d'Or hotel. A prestigious Relais & Châteux property housed in a 14th-century castle, the hotel has a stylish two-starred Michelin restaurant. Enter the unassuming doorway and walk up a flight of stairs to an elegantly understated dining room. The decor is bright and cheerful, with perfectly pressed white linen tablecloths and colorful contemporary wall paintings. 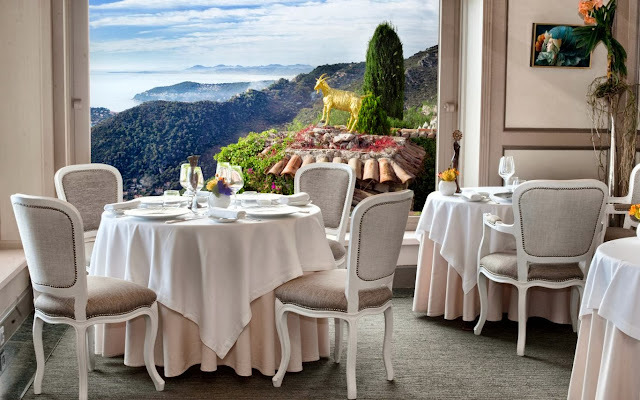 As described by the Michelin Guide: “An institution amongst the eating establishments of the French Riviera, Le Château de la Chèvre d’Or combines the highest quality ingredients to produce sophisticated, fresh tasting cuisine served in a high class setting.” All the tables in the dining room offer a gorgeous outlook onto the Saint Jean-Cap-Ferrat coastline. Luxuriate in the ambience while being mesmerized by the scene of yachts sailing peacefully through the azure blue waters from Monaco to Beaulieu-sur-Mer. Each detail of the cuisine at the Chèvre d'Or Restaurant is exquisite, from the creative amuse-bouches (bite-size appetizers that "amuse the mouth") to the artistic main plates and the incomparable desserts. The menu focuses on Provençal dishes made with fresh ingredients from local markets. The presentation was as impressive as the food. Lemon-olive oil brioche and interesting table decor! Lobster with asparagus, mushrooms, olives and red peppers. The second course rivaled the first in terms of delicious freshness and delicate artistry. Fresh local fish in "foam" sauce with zucchini and tomato. For the grand finale, we sample the most divine dessert imaginable, a stunning strawberry cake created by the Chef de Pâtisserie Julien Dugourd. Layers of delicate genoise cake alternated with sublime vanilla-infused buttercream and raspberry preserves, covered in a translucent strawberry glaze, with a base of crisp wafer-thin butter cookie resting on a bed of vanilla-infused panna cotta. As if that weren’t enough, the dessert was finished with tiny buttons of meringue, fresh mint leaves and a flourish of pulled sugar decor. It might sound like an exaggeration to say that this one slice of cake was worth the 5,000-mile two-thousand-dollar trip across the world. However, the joy found in one bite compensated for every mile and every penny! Dessert "part deux" served with espresso after the meal on the terrace. Chèvre d'Or terrace with a sensational view of the French Riviera's Cap-Ferrat coastline - it doesn't get better than this! Bright purple bougainvillea covers much of the Chèvre d’Or property. I loved the quiet little courtyards overlooking the sea. The gardens are absolutely spectacular! You could spend an entire afternoon just wandering around to admire the beauty. Mediterranean Sea to seduce you into the dream world that is the French Riviera. If you're staying overnight at the hotel, take a dip in the infinity pool to immerse yourself in the beauty of this special place. The good life doesn't get any better than this! Copyright © 2014 , Lisa Alexander. All rights reserved. Very nice article about a great place! I would go to la Chèvre d’Or restaurant just for the view! But dessert "part deux" served with espresso after the meal on the terrace won me over even more. Thanks for your comments! This is truly a wonderful place! I dream of going back to the Chevre d'Or terrace to sample their latest creation!